The Second World War has cast a long shadow over the life of Miriam Katin, born in Budapest in 1942. “The stories my mother told me about our life and survival and the fate of our family, they were always with me. 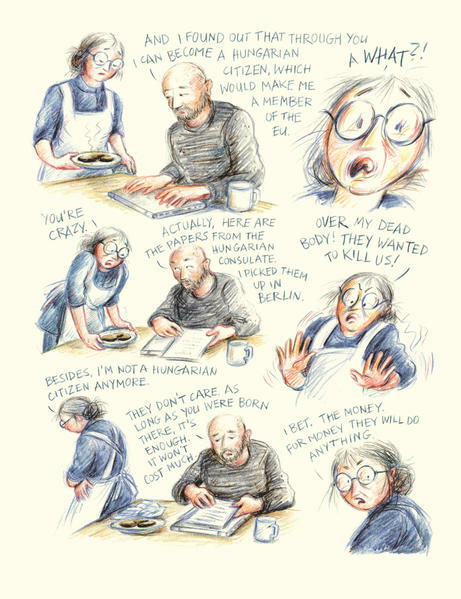 A daily uninvited and unwanted presence.” She fled the Nazi invasion on foot with her mother, who faked their deaths and then evaded the Germans by acquiring fake identity papers. Meanwhile, her father fought in the Hungarian army. At the age of fourteen Katin emigrated to Israel and served in the army as a graphic artist. She went on to become a background designer for animation there, moving to New York in 1991 to work for Disney, MTV and other studios. 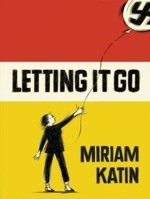 For her follow-up, Letting It Go (D&Q, 2013), Katin channelled “the enormous need to deal with my trauma of my son’s decision to move to Berlin. The process was very difficult but most helpful. I poured my anger and fears into the story.” Switching to coloured crayons, freeing her drawings from the confines of panels, she does not downplay her emotional and physical reactions, as she visits the German capital twice and witnesses how the city is coming to terms with its past, much as Katin tries to do herself. 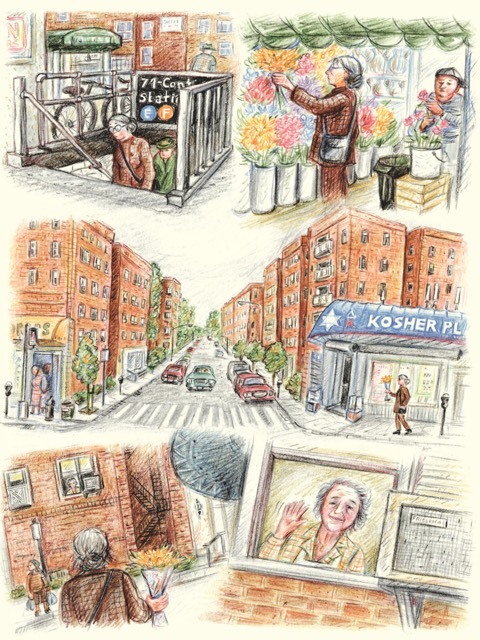 Miriam Katin’s original artwork is included in the House of Illustration exhibition, Comic Creatrix: 100 Women Making Comics, from February 5th to May 15th 2015. What first brought you to making your graphic novels and when did you start? The stories my mother told me about our life and survival during WW2 and the fate of our family, they were always with me. A daily uninvited and unwanted presence. They begged to be told. But I am not a writer and I thought who needs another Holocaust book anyway. However, when I discovered for myself the world of comics, I realised that I can draw these stories. Also, of course, Art Spiegelman’s Maus gave me the “permission” to tell these stories. I was sixty two years old when I did my first comic, We Are On Our Own. 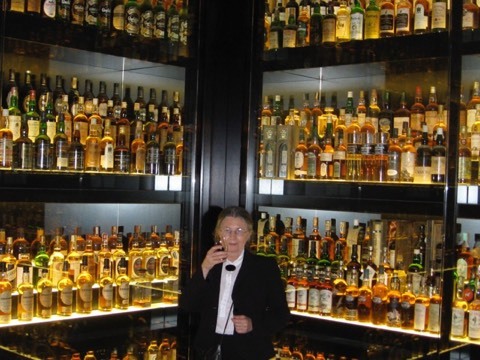 What are your artistic background, training and influences? I barely finished the first year of High School in Budapest when we left for Israel and I never had any more formal education. As I loved Commercial Art and I had some talent drawing, I apprenticed in a well-known Commercial Arts studio in Tel Aviv and also served in the Israeli Army in a graphic arts division. That was my education. What other forms of art do you make? I was drawing as long as I can remember. Mainly people and landscapes in water colours. At some point I did batiks. Apart from suggesting a black-and-white past, why did you choose to put We Are On Our Own into a palette of greys? “Childhood in Black and White” was a title a certain colleague gave to my talk at the New York Symposium and I liked it. The inspiration for greys came naturally from the old photos of my family. Especially the two pictures of my father from the war on page 12. 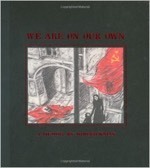 How did you reconcile fragments of memory in this book with your imagination and historical accuracy? I knew many details of that year and I tried to make the story move well for reading. I also did enormous research so that facts, dates, uniforms, weapons and such would be correct. How and how much did you involve your mother in the writing process of We Are On Our Own? How does she feel about your comics? My mother saw that I did a few short stories in comics form of my childhood and once she asked: are you going to do many more of these? I detected an apprehension in her voice so I said no, I am finished. But there was always that question: You were born in 1942 in Hungary? How did you survive? I could not think of doing it with my mother around. But after a while, I said to myself what am I waiting for anyway? 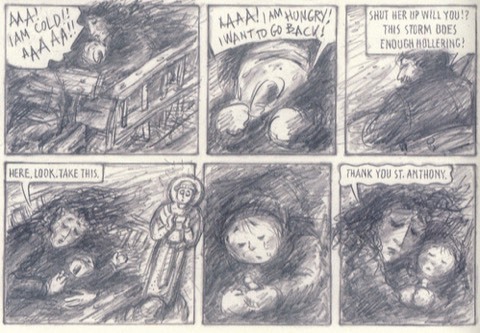 So without telling her I did the roughs and I only showed it to her when Drawn&Quarterly approved it for publication. I let her read it and she was very moved and told me that I had done something very beautiful. What a relief that was. So now she is very proud of me. In Letting It Go, you state, “I live with this stuff every day.” How has your creating your graphic memoirs and sharing them with the public affected your feelings about the past? 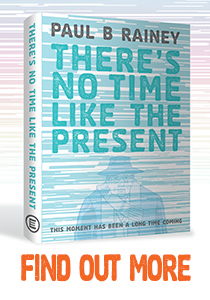 Seth has described comics is less like literature with illustration, more like poetry with graphic design. What appeals to you most about this medium? I don’t write and then draw, it happens in the same time. It is like weaving an intricate fibre. Telling a story in a graphic way, that is the most pleasurable activity, which you can compare perhaps to poetry or composing music. Have you exhibited in galleries? Not in galleries, only a few private exhibits. Please tell me a little about the ideas behind your new 2-page comic for ArtReview. I love humour and I find it in all situations when I get comfortable and familiar with them. I saw this beautiful chair in the Metropolitan Museum’s American wing. This was an exhibit of early American furniture and this one chair by Duncan Phyfe took my breath away. 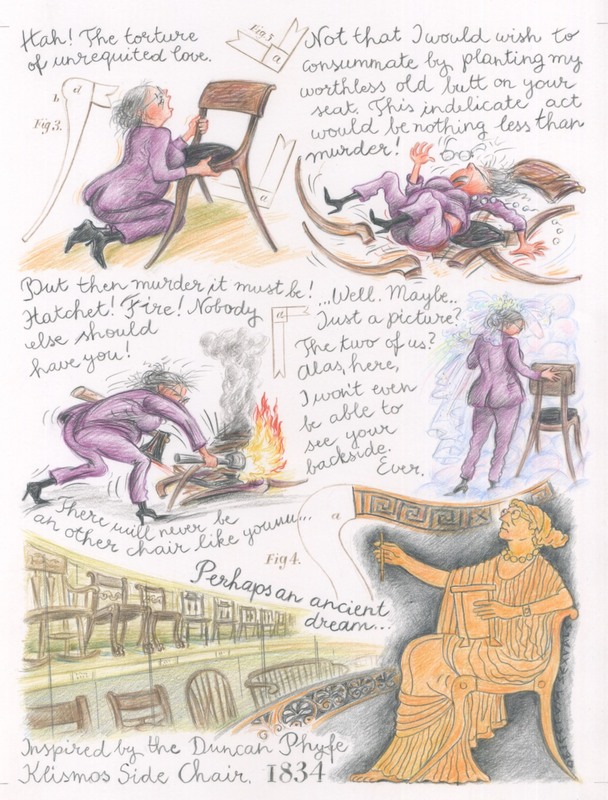 He was very inspired by the ancient Greek Klismos chairs. This particular chair is in a private collection so I can no longer can visit him. 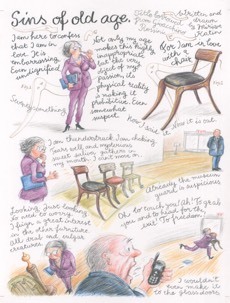 When I decided to do these two pages, years after the exhibit in 2012, I used the sketches I made of the chair (above). At that time I wrote a whole assay for myself so now I could get back to it and relive those feelings and impressions. 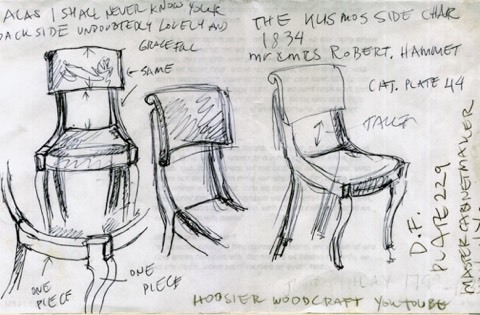 Then I looked at the still available catalogue for the exhibit and found the beautiful technical drawings he made for his chairs. So I used them which are those light brown shapes with the numbers. I don’t have a book in mind, just shorter works, ideas that I was collecting through the years. 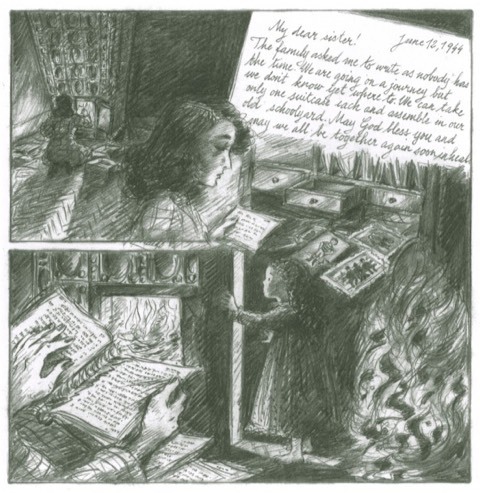 Many writers turn to me about drawing their Holocaust related stories but I can not enter that world again. I just had to do my own. I don’t read books or see movies on that subject and I am very suspicious of works done by people who are not personally related to the Holocaust. Do you know and have any contact with Hungarian comics creators? Since we left Hungary I did not have contact with people in the arts but a very wonderful and brave publisher of comics Antal Bayer found me and published a number of short stories translated to Hungarian. Also right now some pages of my books are included in an exhibit. Surprisingly there is an Israeli Cultural Centre in Budapest. I am very touched by this. 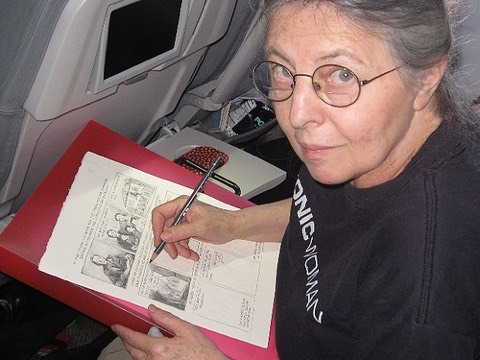 The profile of Miriam Katin originally appeared in ArtReview Magazine, October 2015.